Today, we finally have Google’s new approach to China. So earlier today we stopped censoring our search services—Google Search, Google News, and Google Images—on Google.cn. Users visiting Google.cn are now being redirected to Google.com.hk, where we are offering uncensored search in simplified Chinese, specifically designed for users in mainland China and delivered via our servers in Hong Kong. […] Figuring out how to make good on our promise to stop censoring search on Google.cn has been hard. We want as many people in the world as possible to have access to our services, including users in mainland China, yet the Chinese government has been crystal clear throughout our discussions that self-censorship is a non-negotiable legal requirement. We believe this new approach of providing uncensored search in simplified Chinese from Google.com.hk is a sensible solution to the challenges we’ve faced—it’s entirely legal and will meaningfully increase access to information for people in China. We very much hope that the Chinese government respects our decision, though we are well aware that it could at any time block access to our services. 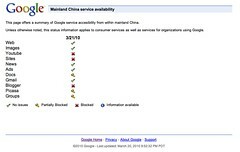 We will therefore be carefully monitoring access issues, and have created this new web page, which we will update regularly each day, so that everyone can see which Google services are available in China. P.S. As of press time (9am MST), there are 4,208 hits already. For a nobody blogger like me, it is quite amazing! I am glad to see Norman Rockwell breaking the record set by Bill Gates’ Daughter (a chain mail hoax the wasted people untold amount of time). 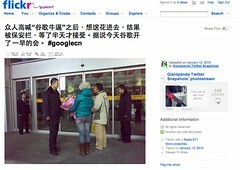 As a result of Goolge’s decision and likely exit from China, some people decided to deliver flowers to Google.cn. For the last few years, I have little respect for Google’s way of operating in China. 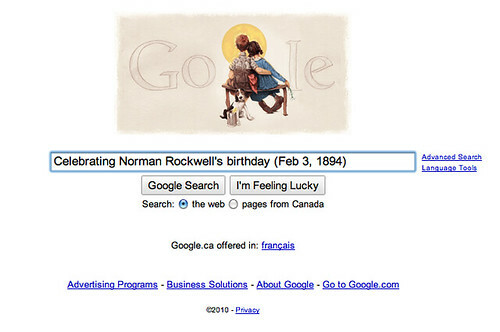 Today, Google has regained a portion of my lost respect. It is probably to early to draw a conclusion. Lets see what happen in the next few days. More reports in Wired, CNet, ZDnet. 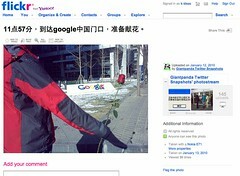 Congrats to Google for regaining its backbone in China! And I also agree with ZDnet in saying “Bravo! Google takes a stand for human rights in China”.